On Wednesday, I showed you a little “treasure” I found in my shed. I laughed at how many of you thought I was going to show you a big snake, raccoon, or some other critter. Luckily, that is not what I found in my shed, but we do have those all around where we live. I know y’all were extremely jealous of the picture of my rust colored shed. I think she has some potential, don’t you? Well, one of my readers sure does. I got a sweet email from Diane after she read my post. Diane is a self-proclaimed “shed junkie.” She shared some adorable pictures with me, many of which are in this post. 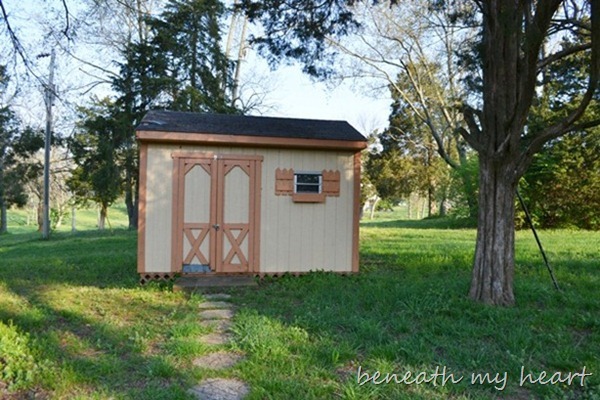 Seeing these pictures made me very excited about the “potential” that my shed possesses. I see big changes in her future. I little “nip”, a little “tuck”, maybe some color? Wow! Isn’t she a beaut?! I love the colors of that shed and those cute little window boxes. Look at the beautiful landscaping around this quaint little shed. I want to get a sleeping bag and spend the night in this one! Wouldn’t a bench look cute in front of my shed? Not really diggin’ the little blow up thingy, though. That thing would be busted in about two seconds flat at my house! I found this beautiful shed online too. It is the result of an amazing shed makeover at High Street Market! Before and After pictures like that just makes me plain giddy!!! It’s going to be a while before we can do a makeover on our shed. But I’m hoping that we can paint it at the same time that we paint the exterior of our home. I would like for them to match, ya know? So, do you see potential beauty in my ugly little shed? 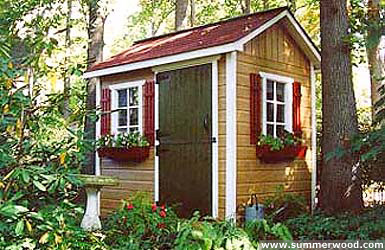 I’m planning on giving our pitiful little shed a makeover when we paint the trim on the house. It will probably be at the beginning of fall though. We were already at 86 degrees today in south Mississippi. 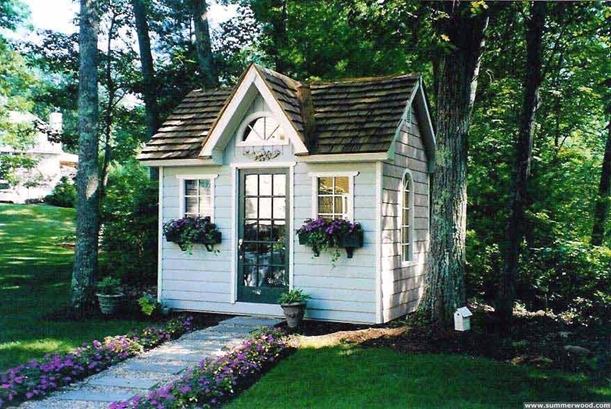 Oh just think of the possibilities of a shed turned mini cottage, work studio, girlie hangout, or…..storage! It has great potential, and, don’t you have a guest cottage on your property too,? 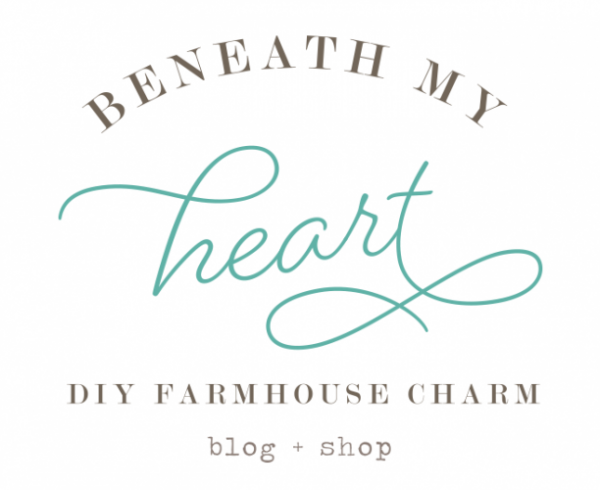 You have a treasure trove of blog material! OH my goodness, I can totally see some potential now that you show me those pictures, lol. Love it! Now, I wish I had a shed to fix up! 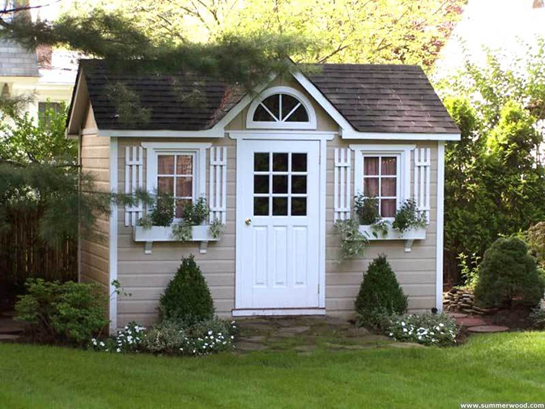 I love garden sheds, and yours has a ton of potential. Can’t wait to see what you do with it. I think new doors and a window on each side with window boxes would be so cute. 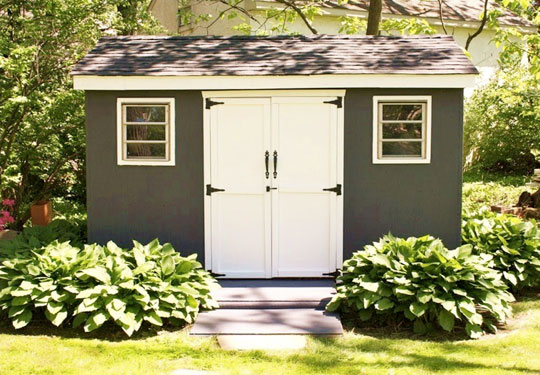 What are you putting in this shed? 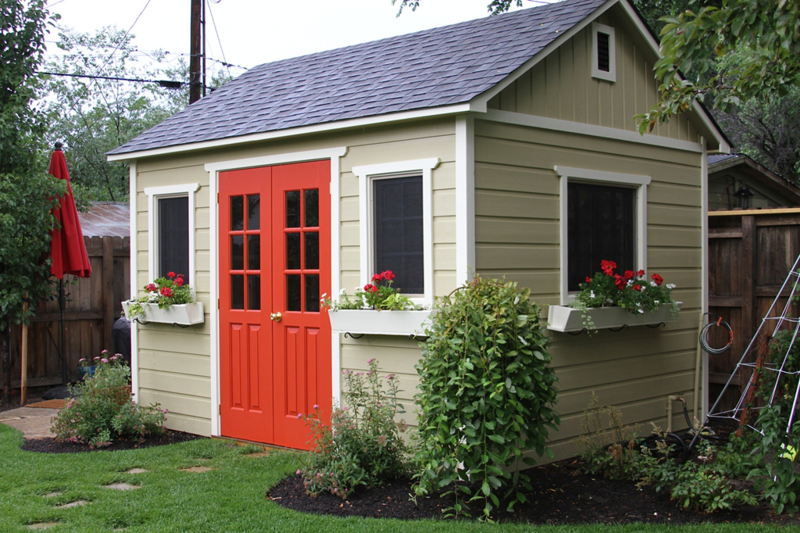 Once you paint the house and then the shed the same color, I am sure you will have ideas popping out all over. Great pictures of sheds!!!! 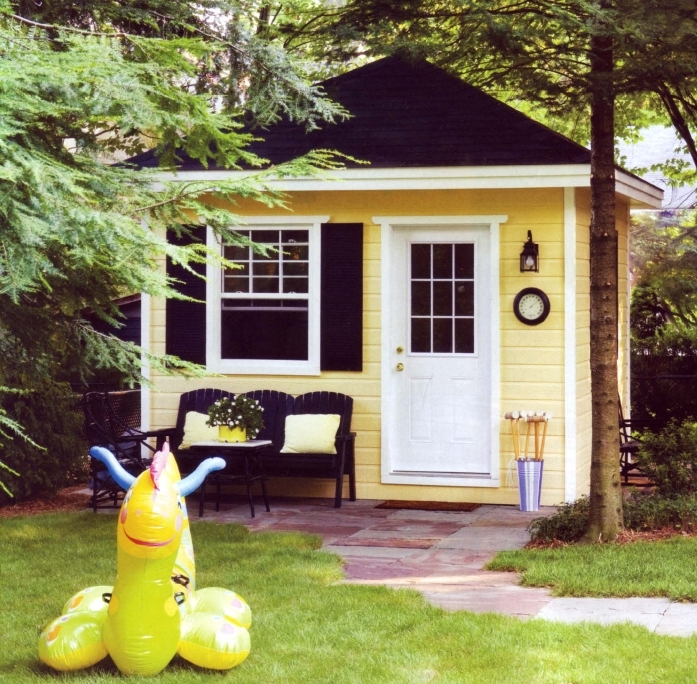 Who would have thought a shed could be so cute!!! 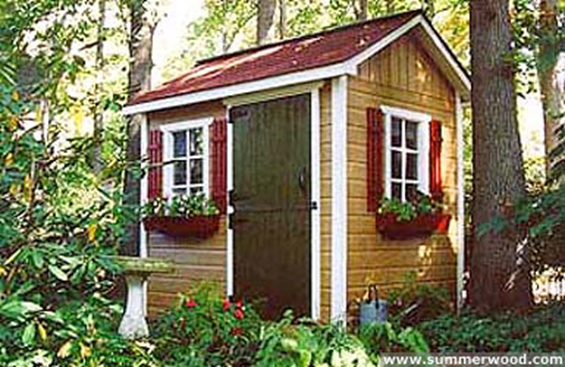 I think your shed is already quite cute, but after seeing all these sheds wow, the potential is endless. bed and highchair, and her lil table and chairs and stove etc, and she loved it until……………………………. Even to this day my daughter is hates and is afraid of bugs, and she is 27 yrs. old. Anyway, can’t wait to see you nip and tuck that shed, I know it will be even more adorable than it is now. and wow, what a wonderful surprise you found in your shed. Know they are gonna look awesome when you finish them. Bet your boys are looking forward to that. What a sweet and unexpected blessing!! Have fun with it! 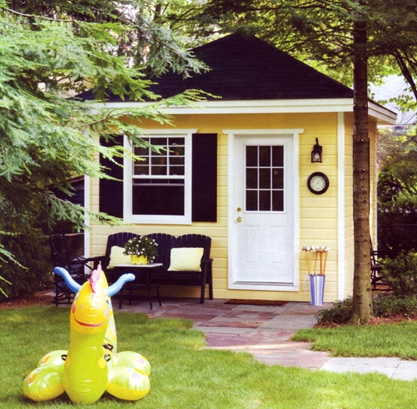 Your shed is going to be adorable. I don’t think its too bad to begin with! I love the window boxes on the inspiration sheds. Can’t wait to see what you come up with. I agree that your shed already has good bones! I’m voting for extending the window box to the width of those charming shutters and putting a bench beneath to balance things out ( and provide a space to sit and put stuff). …maybe paint the doors all one colour and even putting plexiglass (or glass) into the upper portions to let in more light. Add a little landscaping to tie it in with the beautiful surroundings and you’re done! A friend promised me their shed if I came and dismantled it; now I can hardly wait to move on that! It’s funny how the non-priority project can really fire the imagination. I think it’s just a form of procrastination for me! Nice shed already and will be a great shed after you get your hands on it. Will be great!!! Wow – those are fabulous! You are so lucky to have that shed and a husband who can make it look however you want!!! Also anxious to see what you do with those cabinets you found in there – great find!! Yep- a new coat of paint and few aesthetic fixes and it could be anything. Storage, craft room, kiddo hangout, etc. We only have one of those prefab metal thingies that have no personality and harbor wasps (yarp). Hubby is actually organizing it right now. We finally got above 50 degrees and have sun in the Seattle area!!! YAY! Love your ideas, Traci! 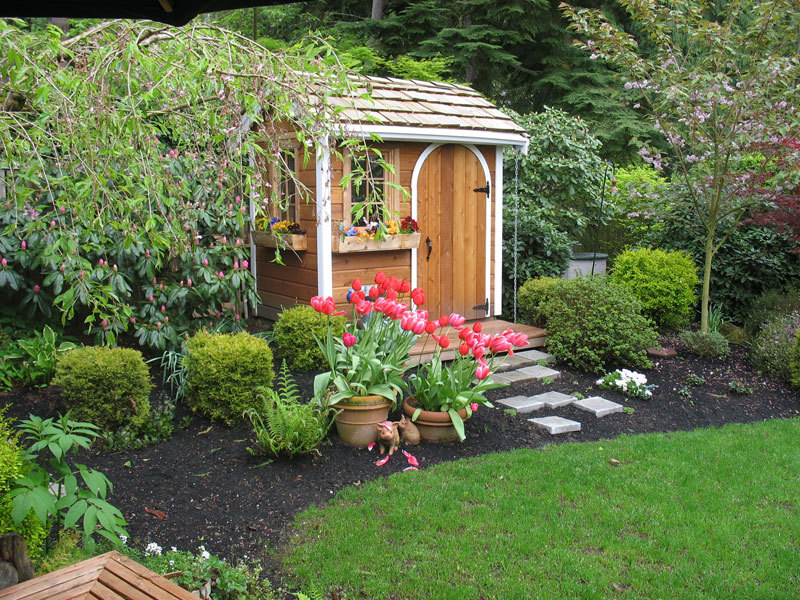 Your shed is in the perfect spot to really make it look cute! So…hurry up and get it done! We’re all itching to see the big reveal!! lol! You sure have a lot of choices to follow. Can’t wait to see what you do. Thanks for the post. In my heart of hearts, I believe every neglected shed deserves a little love and in return will stand tall and proud :-) I am positive whatever you decide to do will turn out beautiful, everything else does! I absolutely, without a doubt, cannot WAIT to see what you turn this into! OH WHAT FUN! I love the idea of creating window boxes under the shed windows. I once saw an idea where someone had used old soda crates and made cute window boxes out of those! Thanks for the inspiration! I too have a shed that was actually once a tack room for horses. My husband put new siding on it and installed a plywood floor with a drain in one corner so I can do pottery (some day). I’m going to have him put a couple of windows in it and then I’ll paint the outside to match the house and also some window boxes. I can’t wait for spring to get started. Transforming old sheds is such an idea way to ‘recycle’. Good luck with yours!! I’m hoping to post before and after pics of mine as soon as I figure out how! !